I wouldn't take one of your "turdles" for free, why in the world do you think I would buy one? To paraphrase Edge, this man is a big, fat, failure turdle. Pictured above: A big, fat, failure turtle. lol this is just an all around failure!! And yet the BIGGEST Fail here is photographing this HIDEOUS TURD, in THOSE SHORTS!! Who do I sue for all therapy and mental bleach expenses I'm going to accrue, trying to get THIS image outta my head?!?!? The photographer, the fool who posted this or IT for even wearing those shorts?!?!? "One minute sir, I'm squeezing another turdle out right now." i think you spelled it worng, theres no "les"
And they're not even turtles, by the look of it! They're tortoises!.. Or should I say: tordoiles? Hey look, it's an American! are they made from turds? ive been looking for them! 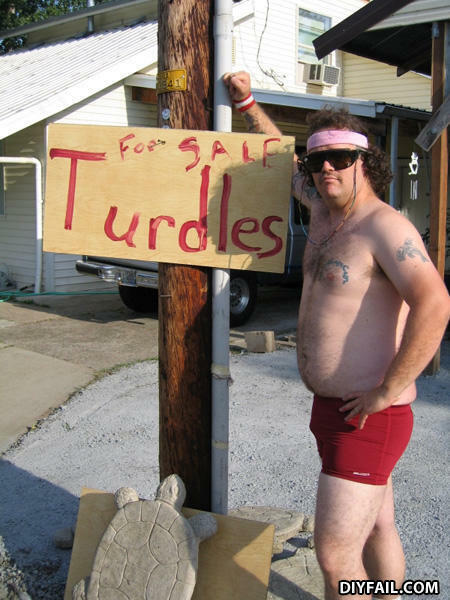 Just when you thought real fashion had been lost, Turdle man comes in and totally gives us hope !! Q: Why is Rosie odonell fat? A: Because you are sexual attracted to small children.